On April 16th 2016, the nation, Ecuador was hit by a colossal earthquake of magnitude 7.8. The severity of the disaster reverberated throughout the entire country, leaving at least 500 dead and 27,500 injured. Moved by the plight of Ecuadorians, T.B. 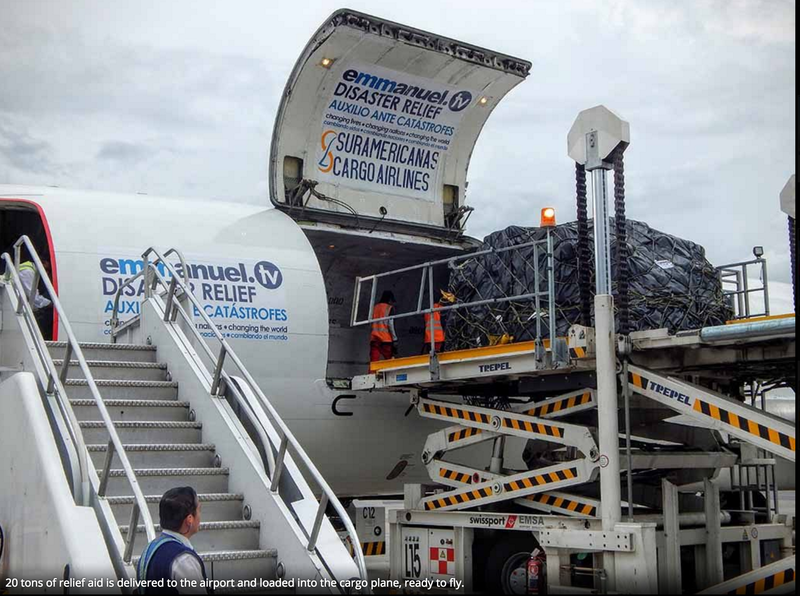 Joshua – Founder of Emmanuel TV – sent a relief team to Esmeraldas Province, Ecuador and dispatched a Boeing 727 Cargo Plane, which contained 20 tons of relief hygiene materials, perishable, and non-perishable food stuff. Upon arrival, the relief and aid supplies were received by representatives of the Minister of Defense on behalf of the people ofEcuador. 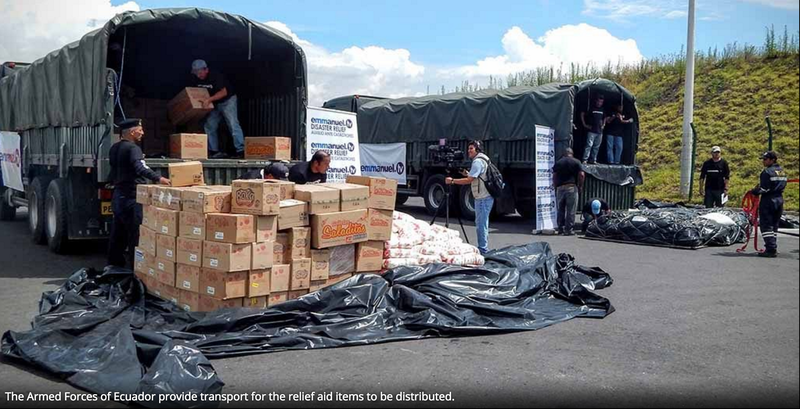 The Armed Forces of Ecuador loaded the aid into army trucks and transported to the Emmanuel TV Operations Center, situated close to Esmeraldas City. The supplies were offloaded, repackaged, and distributed to various shelter camps in the Esmeraldas Province. 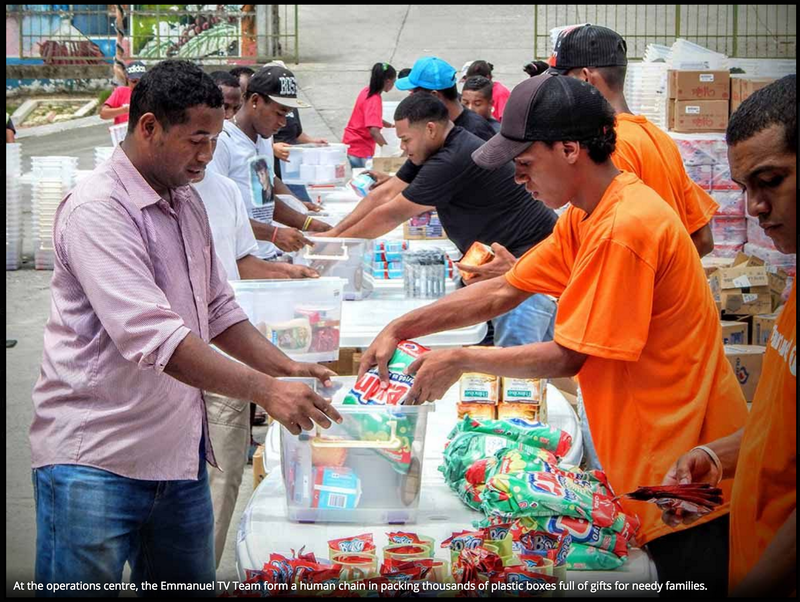 The Emmanuel TV Team also extended its relief efforts to a remote village, Chachi de San Salvador, which had also been gravely affected by the quake in the areas of access to clean water and the destruction of its local school. In response to this particular community’s needs, the Team supplied the community with equipment that converts river and unclean water into potable water. The Team is also undergoing a school construction project – at a cost of US$262,000 – to rebuild the entire school complex that was destroyed. The reconstructed school will provide learning facilities for 350 students. 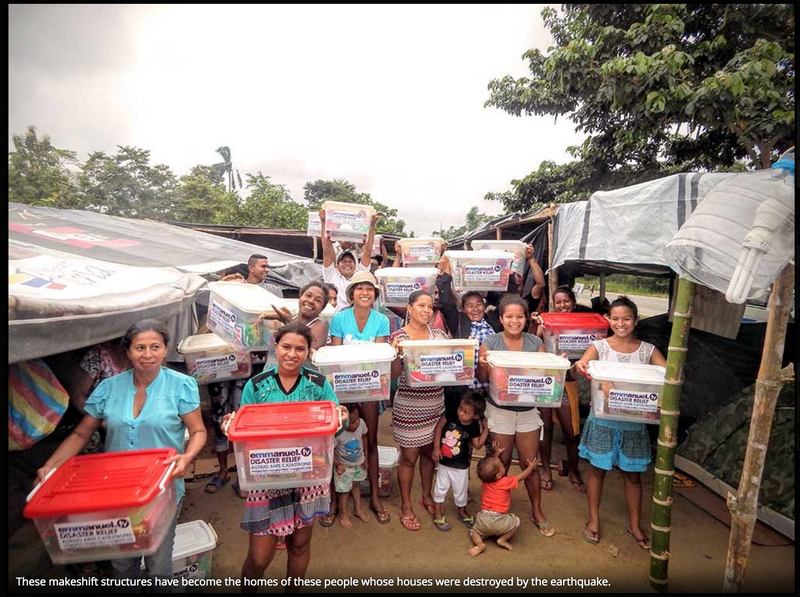 The people of Ecuador, as well as its Government, continue to express their gratitude for the Emmanuel TV Ecuador Relief efforts. A grateful beneficiary, from the Chachi community, said: “This is the first aid we have received from another country”. 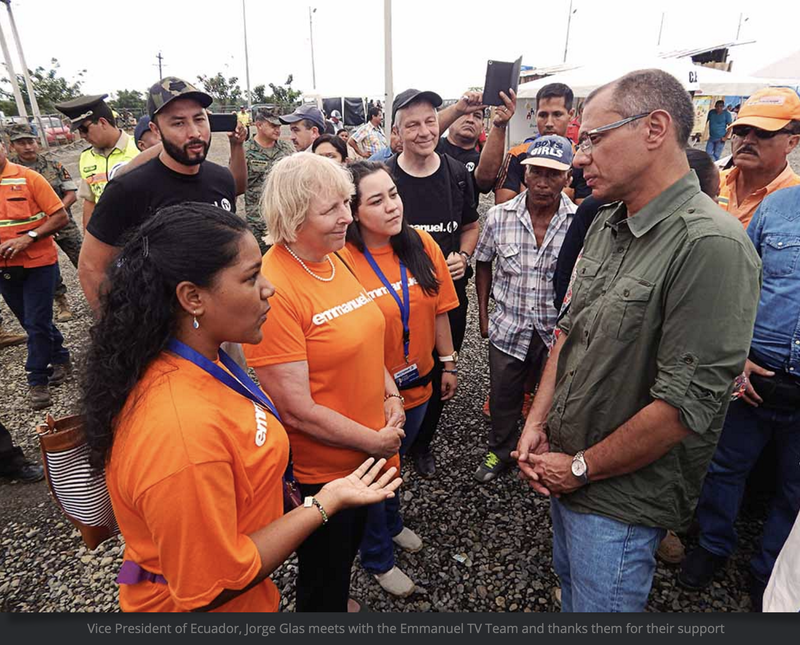 The relief efforts have aided over 5,000 Ecuadorians, totalling over half a million US Dollars. Emmanuel TV is an international TV Station and NGO, headquartered in Lagos, Nigeria. It was founded by T.B. Joshua, a philanthropist, who has been responding to individual and societal needs across the world. Emmanuel TV has been providing food aid to poor communities in Colorado, USA; promoting women’s rights by providing funds to widows to start small businesses; building a school in Lahore, Pakistan and granting international scholarships – these are among a fraction of its practices. Such humanitarian endeavours are its strides to achieving the international community’s Sustainable Development Goals. Thank you for the update on Ecuador earthquake assistance. We are forever grateful to God for His mercy, grace and love for us humanity. Thank you Prophet for letting God use you as the labourer in His vineyard. Bakuh ATAH ADONAINU, ELOHEINU MELKHEINU HAOLAMNU. Asher kideshanu bem’tz votav v’ts’vanu. Thanks a lot for your philantropy in touching the lives of many in needs, and your works are ever before our creator Almighty G-D, YESHUA MESHIKHAH & THE HOLY SPIRIT. Almighty, bless Prophet Tb Joshua. GOD BLESS YOU ALL THOSE WHO MADE THIS POSSIBLE MOST EXPECIALLY PROPHET T. B. JOSHUA. MAN OF GOD PRAY FOR ME I NEED A GOD’S FAVOR. PRAY PROTECTION OVER ALL THE EARTH.AND MAY GOD INCREASE THE GRACE OF THE LORD IN YOU.AMEN. T.B.JOSWA. you are reaching the world in all areas, you are a bleesing to the world, you are a Man of God of our time. May God Continue Blessing You More And More. Glory.God bless the great man of God . Our prophet of end times may God continue to pour on you His abundant grace. God bless prophet T B Joshua and all the Emmanuel TV partners all around the world. May God richly bless you.you are Doing a gud job.thank you very much for your Help. Thank you Lord for using the EMMANUEL tv team to impact the lives of the people of Equador.Your mercy continue to speak for them and release Grace in abundance on our Prophet and the Family at The Synagogue Church of All Nations in Jesus name we pray Amen.You are indeed an extension of Heaven on Earth! i am very proud to be a member of the Emmanuel t,v partnership. When i saw what good they are doing in the world, my spirit told me that whatever i give it must be given to the Emmanuel t.v,partners.The joy that I get when i deposit the little that i can cannot describe. it.There is no one else in the world that does the good world wide, may they all ways be blessed. I am really surprised that TB Joshua is helping people affected by different problems all over the world. God is helping man of God to address the problems of people all over the world. Why not you come to Ethiopia. Emmanuel!!! I live in Benin City, Nigeria (08184322200). Please send me the MORNING WATER. God bless Prophet T. B Joshua and his team. Good Morning. Be warned that there are Frauders who are on mails pretending to present Prophet Tb Joshua, Emmanuel TV and Scoan. Don’t be scam, no Spiritual items are send through DHL. This are Frauders and are nothing with the Prophet. Good morning ,God bless you for always thinking about other peoples welfare,we appreciate what God is using you to do for us,we thank you and your TV Partners.Emmanuel !!!!! Man of God in fact God will bless you well well for the good things you are doing for mankind. May His face shine upon you and your team and family. In fact I am short of words. Our awesome God is reealing His secrets from heaven above through His Son Prophet TB Joshua. Who am I to resist all the reverations! I would like to join this circle of love. God bless the SCOAN FAMILY”. Emmanuel TV, Changing lives, changing the nations and changing the world in Jesus Christ’s name. Don’t doubt it because there are proofs. Don’t be dupes., she has nothing to represent Prophet Tb Joshua, Emanuel Tv.or Scoan. Anything she send to you are forged eg Anointed stickers, Faith Bracelet or Anointing Water. This kind of spontaneous assistance is what makes me proud to be an EMMANUEL TV partner. We are called to be one anothers keeper. May the Almighty God be praised. Thank you Jesus ,Let love lead. Viewers All Over The World. Distance is not a barrier. I’m so awestruck…,God’s true Love functions here as exemplified by the respectable Prophet and man of God ; may the Almighty God continue to guide and support him and the entire worldwide ministry, in Jesus name Amen . people of God outside Nigeria. please be careful.